Size: 2 " x 3.5"
We are leading manufacturer and supplier of Christmas hanging and other Christmas decorative items in metal like aluminum, iron, steel etc. The same design of \hanging Christmas tree is of stainless steel metal with polish finish. 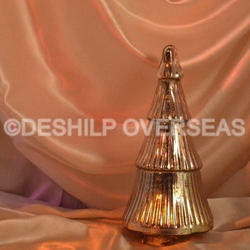 These beautiful Christmas tree ornaments are beautifully design with beads and nickel plated metal. These enhance the elegance and beauty of the Christmas tree. These are customizable in colors, patterns and designs. Christmas tree decoration. Available in all Colours. 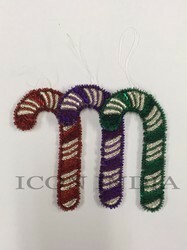 These sequence beaded christmas ornaments gives very attractive look when they are hanged on the tree. The are made by using best quality raw material. They can be made in different colours, sizes and shapes.